WHAT the Government did on the floor of Parliament on Friday, before getting away from being directly answerable, was a low act. The tacticians swept aside the interests of the 109 MPs’ constituents around the country by swinging in strict new powers and exemption rights for the Environment and Conservation director. In effect, the powers will enable one man, the director, to okay the environmental practices planned for resource projects without the people being able to challenge that bureaucratic dictatorship. The Opposition was caught on the hop, like the media and other organisations that might have wanted to say something about the draconian changes. It is plainly flying in the face of the matter currently before the National Court over the well advanced Ramu nickel mine in Madang. It is also obviously designed to frustrate any well-intentioned or mischievous individuals and groups from interfering with the first and following LNG projects. It is obvious that the Government has decided that development of any type is good and that any obstacles to resource projects must be swept aside. Environment Minister Benny Allen said the “national interest’’ was paramount and justified the legislative changes, which removed threats to PNG’s economy and revenue bases. We venture to suggest that the Minister’s electorate of Unggai-Bena has little prospect of harbouring any major resource projects. If there was a hill of gold or nickel there, he would certainly find his constituents in revolt mood if they found that they could not object to environmental risk to their streams or villages. Likewise, other ministers and leading MPs are either in areas with no chance of unearthing major projects or, possibly, they prefer their constituents to have no voice in what happens to their land and water. Former Attorney-General Dr Allan Marat rightly points out that the amendments to the law are open to challenge if they are found to breach parts of the Constitution. We suspect lawyers with a conscience and many landowner groups will have spent much of the weekend studying the possibilities. This legislative “kamikaze’’ action seems to have rendered the title, Environment and Conservation Department, as a contradiction in terms. What sort of built-in safeguards will there be to ensure that one man sitting in an office at Waigani does not make a dreadful mistake which could ruin part of PNG? By passing amendments to the Environment Act, the government has put foreign companies above the law; allowed their commercial interests to trample all over the rights of Papua New Guinea’s traditional landowners; and undermined our democracy by removing the fundamental protection of the separation of powers. On May 27th the government rushed through Parliament amendments to the Environment Act which give to the Secretary of the Department of Conservation new powers to approve activities by mining and petroleum companies without consulting traditional landowners or securing their agreement. This is a fundamental denial of the traditional rights of landowners but the changes to the law do not end there. FIRSTLY landowners are also being denied the right to challenge what the government allows mining and petroleum companies to do. The amendments allow the Environment Secretary to approve activities and any such approval is FINAL AND CANNOT BE CHALLENGED IN ANY COURT. So no matter how outrageous or unfair the approval, the people will have no way of challenging it. SECONDLY, and worse still, the amendments state that when the company carries out the approved activities it cannot be sued, whether in tort or any other law and the activities cannot be an offence and cannot be unlawful. This means that no matter what harm the company causes to any person or group of persons they will have no recourse to the law – even for an oil spill on the scale of that unfolding right now in the Gulf of Mexico. These two amendments effectively take away all a citizens traditional rights (rights developed over tens of thousands of years); common law rights (rights that the courts have developed over hundreds of years); and removes any criminal liability. Companies are effectively being given carte blanche to do what the hell they like and cause as much damage as they want and nobody can do anything to stop it or claim compensation. As if this were not enough, the changes to the Environment Act effectively remove the last pillar of our democracy. Democratic government is based on the separation of powers where the independence of the judiciary, executive and Parliament are closely guarded so that each can act as a check and balance on the other. Already, in PNG we have seen a fundamental weakening of our democracy with the loss of the separation of the Executive (Prime Minister and National Executive Council) and Parliament. As the government controls so many MPs Parliament has long ceased to be an effective check or balance on the policy and legislation put forward by the Executive, and with the increase in the number of Ministries to 32 the Executive already holds the numbers to constitute a quorum in Parliament without even informing the rest of the MPs. But our democracy survives, or has until now, because we still had recourse to the judiciary to challenge any action by the Executive or Parliament. But now the Executive has decided, and Parliament has approved, some Executive decisions shall be exempt from the scrutiny of the courts and thus all individual rights in respect of those decisions have been removed. This is totalitarian, unjust and undemocratic. The fact that the changes to the Environment Act were rushed through Parliament in a single day with no effective debate or scrutiny only serves to emphasize not only the loss of the separation between the Executive and Parliament, but also exactly why that distinction is so important in maintaining the other freedoms in our society and, crucially, protecting the independent scrutiny of the judiciary. This is occurring not just because many of our politicians are too stupid to know what it is they are doing, it is occurring because the executive has been captured by powerful foreign interests, in this case the Chinese State which owns the Ramu Nickel Mine and Exxon-Mobil (the most profitable corporation in the world and one whose PROFITS are larger than the economies of ninety-three nations). The law is being made in light of the recent court decision [Ramu nickel mine] that has exposed resource projects to the risk that any permits granted by the state in satisfaction of legal and scientific requirements may not be enforceable… all major mining and petroleum resource projects (such as [Exxon Mobil] LNG) are particularly at risk affecting the economy and therefore a matter of national interest…. In PNG our democracy has been taken away and it is the Chinese and Exxon-Mobil who now set the rules by which our resources will be removed while we endure the social and environmental consequences without any recourse (except, of course, to what our Constitution reminds us never to lose, our unique and innate Papua New Guinean ways). On 18 April we asked the question “Where to the Chinese go next?” in response to the injunction stopping the construction of a system to dump the waste from the Ramu nickel mine in the sea. One option that seemed likely was a change in the law to take away landowners rights to demand protection of their natural environment. On Friday afternoon this prediction proved correct as the government rushed emergency legislation through Parliament that disenfranchises landowners and gives the government total control over their land and seas. “This is to inform you of the latest developments that occurred yesterday in Parliament. “The government through the Environment minister, Benny Allan, made changes to sections the Environment Act 2000 to prevent landowners and concerned Papua New Guineans from “interfering” with developing project like the Ramu Nickel Mine and LNG in the Southern Highlands. “This comes after a petition against DSTP was presented to the Deputy Prime Minister, Puka Temu and Environment Minister, Benny Allan, in Bongu Village on 10 April. The petition deadline is on Monday 31 April. But the government has seen fit to insult landowners by changing the law! “The explanatory notes provided to the media make no secret of the fact that this is an attempt by a corrupt regime to suppress the rights of landowners who are concerned about their lives and the environment to which they are connected. “This is a direct insult to the people of Raikos and all Papua New Guineans who are landowners. Personally, I am angered by the government’s actions! The law change is a serious attack on our ability as landowners and Papua New Guineans to speak out against problems created by the actions of government and developers. “This is the first of many public messages that I will deliver to various audiences. Our first course of action is to create a national awareness of this change in the law as it affects all Papua New Guineans. A public Forum will be held on Tuesday (1 June) in Madang town. Then on Wednesday (2 June), a team of landowners will travel to Port Moresby to publicly express our anger in the media over the law change. 1) If you wish to assist us further, please provide your DIGICEL numbers to my number mob: 7349 9437 so that messages and updates can be sent to you personally. I am seeking your help in sending that same message to your contacts. 2) We also ask you to send this email to as many of your contacts as possible. Indigenous landowners from the Rai Coast in Madang, whose traditional livelihoods and pristine environment are threatened by plans to dump 100 million tonnes of mine waste in their seas, have sent a stark message to their government: there will be no submarine tailings disposal. 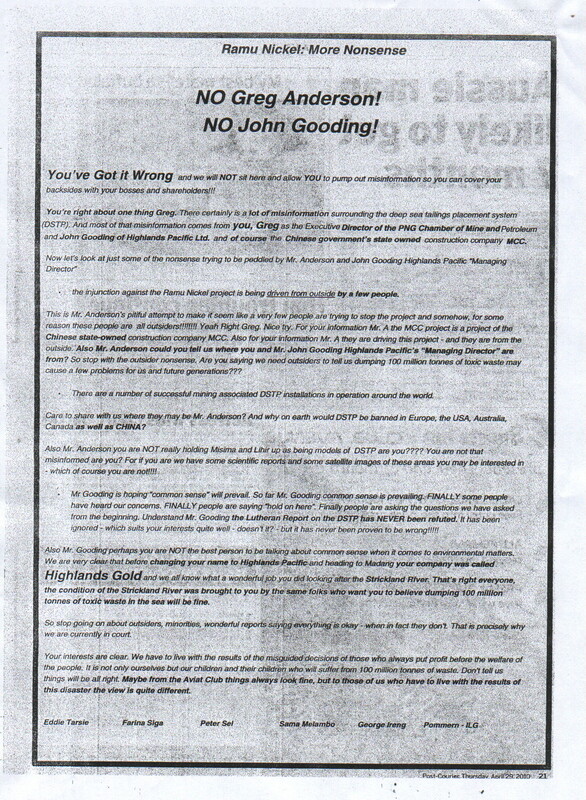 This message has been conveyed to Deputy Prime Minister, Puka Temu, and Environment Minister, Benny Allen, in a full page newspaper advertisment which is reproduced below. Temu and Allen visited the Rai Coast three weeks ago to receive a 7,500 signature petition from the people protesting against the planned dumping. Both Temu and Allen gave speeches saying the planned STD would go ahead despite the people’s opposition. The people have now responded to the politicians and their message is clear – even if the government allows the Chinese State owned Ramu nickel mine to build a submarine tailings disposal system, the local people will not allow the dumping. The PNG Government claims it does not have a copy of the independent report it commissioned on the impacts of allowing marine dumping of waste from the Chinese State owned Ramu nickel mine. 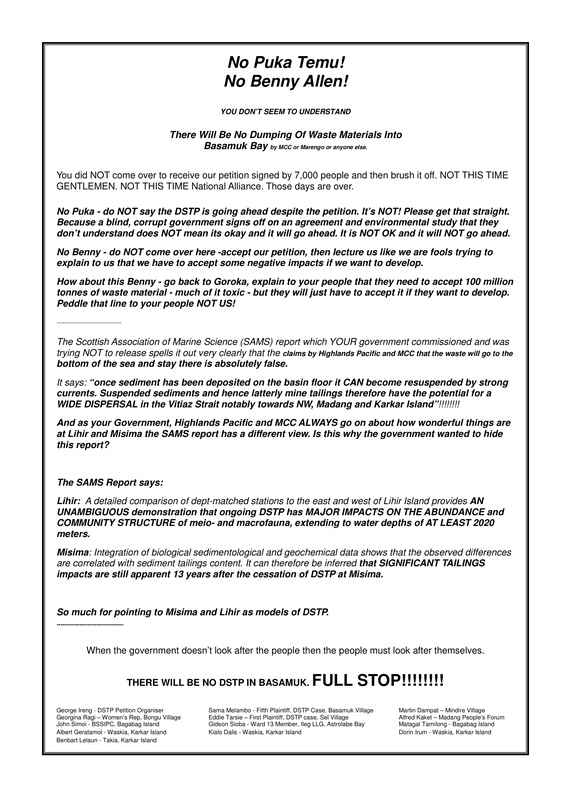 The Report by the Scottish Association of Marine Science says marine dumping at Lihir and Misima mines has had significant impacts and the same will be true for the Ramu mine.